Methuen Community Television is a local, non-profit television station dedicated to covering the community of Methuen. Our goal is to give the people of Methuen an opportunity to use the media effectively to inform their neighbors about the issues affecting our community. We also strive to provide a venue for local sports, the arts, religious and non-profit organizations and business leaders’ expertise to be shared. MCTV was founded in 1996 when citizens and members of the Cable Advisory Board decided that the cable television operator was not enthusiastic about providing local programming. They petitioned the Mayor of the City to amend the Cable Television license and create an independent corporation. The station would be funded by a fee, paid by the city’s cable subscribers as well as sponsorships from local businesses. The original Board of Directors was selected by the Mayor of the City. From its origins at Methuen High School, MCTV moved to a professional office park and operated there from 2003-2017. This facility was custom designed and built to meet the needs of the organization as it grew to serve the community. But Methuen Community Television had a larger vision – OWN a space where officials and citizens of the community could gather to make media. In 2017, that dream was realized when MCTV opened at 20 Aegean Drive, Unit 11 in Methuen. We currently have a large four camera studio, a smaller three camera studio, a kitchen where cooking shows can be produced, three editing rooms, eight field cameras, and a portable studio. MCTV is also available as rental space for meetings, photo shoots and other productions. We plan to add a Podcast Studio in 2019. With its state of the art facilities, MCTV revamped its training program to better serve our members. They have been trained in producing, directing, hosting, studio operations and field equipment operations. We have also supported our membership through Member’s Night Workshops, School Vacation Children’s Workshops, and Volunteer Day events. Since 2004, MCTV staff and MCTV members have won two national HOMETOWN awards, two Honorable Mentions at the National level, four regional first place awards and 18 other regional awards for its programming. In addition, two programs, “Call to Serve” and “The Empty Chair: Exposing Addiction” have been recognized with the Northeast region Alliance for Community Media’s RIKA WELSH COMMUNITY IMPACT award. We have also been on the scene of local events including the Santa Parade, State of the City Address, Book of Golden Deeds dinner, Methuen Day and many more. MCTV has also provided complete and comprehensive election coverage. 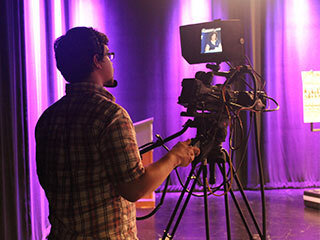 Every election season since 2003, MCTV produced candidate debates as well as live election night coverage. 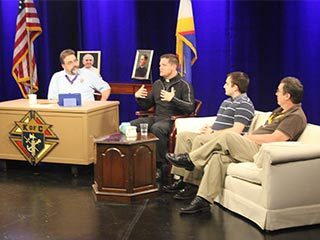 All citizens of Methuen, 16 years of age or older, are encouraged to become members of MCTV. Junior memberships are open to those 13-16 with a parent or guardian supervising their participation. Currently, training classes are at no cost and there is no minimum time commitment. Don’t just watch television, be a part of it, and learn more about what makes television, what makes Methuen, and more about yourself in the process. Karen has over 20 years of studio management experience and over 30 years of production and training creation. After graduating Fitchburg State College, Karen worked in corporate media for Filene’s and DMA Inc. before moving into local access television. She spent 13 years in Andover, MA and one and a half years in Reading, MA before coming to Methuen in 2002. She serves as the Chair of Alliance for Community Media Northeast Regional board. Michelle was a member of the production team for the Lowell (MA) Cable News for seven years serving as camera operator, segment producer, director, and editor. A graduate of Bridgewater State College, Michelle has over 20 years experience in production and training. She came to MCTV as the volunteer host of Methuen Now in 2003, and was hired as Membership Coordinator in 2004. She was promoted to her new position in February 2017. Carol Ann has been active with MCTV for ten years. During that time, she has directed multiple shows including the award winning “The Empty Chair: Exposing Addiction”. She has also covered “Methuen Now” stories on various topics. She has worked on programs with our elected officials and has been trained to cover meetings at City Hall. She has her Bachelor of Arts in Communications from Southern New Hampshire University. Ian is a graduate of Franklin Pierce University with a Bachelor’s degree in Mass Communication. At the age of 16, he directed the episode of “In Focus” featuring Phil and Colleen Lahey talking straight about her addiction and recovery. This episode won First Place for Profile Talk Show from the Alliance for Community Media’s Northeast Regional Video Festival. Ian has also worked on many other shows including “Red Sox Monthly”, “Patriot Pride”, “Around the Valley with Bruce Arnold”, MCTV Election coverage and “Methuen Now”. He taught MCTV staff and members about Motion, an animation software that works with Final Cut. He has been updating our Video on Demand system and assisting members with their programs. Jim had been an MCTV volunteer for 15 years. His work on Methuen High School sports coverage is his signature contribution to our programming line-up. He added sharp looking opens, game clock information via a small camera, and occasional replays. He took the lead on setting up multi-camera productions using the MCTV van. Jim’s background in Inventory Control as well as his familiarity with MCTV’s portable studio and other field production gear.